This was my mantra. This was my warrior code. This was the mortar in my wall that I used to block you out. I didn’t need you – never did before, so why would I now? I liked to be the macho guy, to be the martyr who suffered, <sniff!>, so that you could see that I was strong. I resented getting assistance in any way, shape or form. I was beyond what you other weaklings did for one another. Every man for themselves, I would say, beating my chest. And yet, deep down, I felt weak, pathetic, and less of a man. I was worthless, yet I could still save myself. I had the wherewithal to show everyone that I was made of sandpaper, that I was the anchor of the S.S Lone Wolf. And still…I felt that I couldn’t do right by me or anyone else. Failure followed me at every turn. I drank. This was the coat I wore, the mask I painted on, the kryptonite I put into my veins to keep you at bay and away from me. My eyes, deadened already from pain and drink, seared into others the need for me to be left-the-hell-alone. And if that wasn’t successful, my words would impale and deflect like a viking in battle. I was afraid that if you got to know me in any way, you would run from me. So I sent you packing before you could hurt me. Game, set and match…and yet, I was the only one playing. I only defeated myself. And I isolated to finish the deal. I drank. I was a legend in my own mind and didn’t need someone to come in an play the stud when the lead role was already taken by me. Take a hike, pal. I had full control of everything, including my drinking. Oh sure, there were some rough patches, and who doesn’t have a bad day now and then? We go through phases don’t we? I mean, even the hero gets sissy slapped around now and then. Nothing that a few drinks couldn’t fix. Or a few more. I didn’t need anyone to tell me what the deal was with on anything in my life, because I had it all figured out. I just needed time to figure it out, is all. I needed just some space to unlock the truth, to crack open my own true self, to hot wire my heart to beat a little stronger. I drank. Please help me…I’m dying…and I don’t want to die like this. Where did it all go wrong? The pain, the suffering, the hurt, the lashes and gashes at my soul and spirit buckled my knees, fears flapped around me like gulls on the pier and the idea of living with the drink and living without the drink had brought me to the point of insanity. I was crazed and defeated…and dying. My alcoholism was suicide by installment plan. It was a matter of time. I couldn’t do it any more. I was done. I couldn’t drink. Is that really me thinking this now? If there is something that I have learned in my short time in recovery is that I need to work with others. I need to help other alcoholics, I need to carry the message of hope , I need to allow my past hurts and heals help someone else turn their own hurts to heals. I am only a drunk, just someone who’s light-from-dark can perhaps illuminate someone else’s dwelling of pain and sorrow. Many men and women have done things for me that I can never repay. They have spent countless time, energy and/or money trying to help me, or hung right by me and watched as I burned my life to the ground yet one more time, but never left. There are so many who have stood by me, who have picked me up when I wanted anything else but that, who actually gave a damn about me when I couldn’t even look at myself in the mirror. There aren’t enough dollars or days in me to pay back what has been bestowed upon me from those who would and want help me. 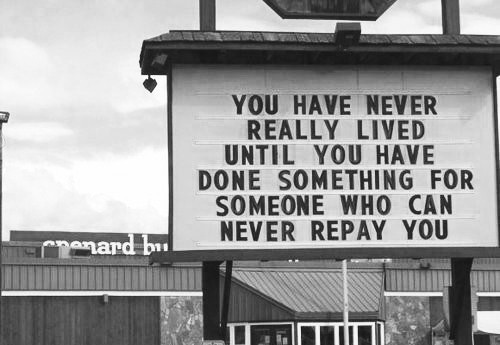 But what I can do is pay it forward. I can give to the next person who needs a jump start, I can give to the next person who feels that they are alone, I can give to the next person who just requires someone to tell them that things do indeed get better. Can I be the one to do that? The thing is this – when I help someone else, especially an alcoholic, I get out of myself. Plain and simple. I am not spinning, thinking of myself and ingesting copious amounts of Vitamin “I”. I am being useful – something I never felt before. I can actually contribute and not take. I can show love and compassion, not bare my teeth and growl when asked to be near some one and take in their humanness. I can be of service to someone who was once like me. And if you’re like me – not wanting help, not needing anyone, not feeling deserving of love and attention…that’s ok. I will still be here, arms waiting to close tightly around you, as I whisper to you, “You are needed”. Thanks for this. Really resonated. Thanks so much, mished…I totally understand what you mean. I love when we all just understand one another…that’s the beauty of this community and the fellowship. It’s very kind of you to take time to visit and comment! I’d like to wrap you in a beautiful package and send you to a hospital in Houston. I hope you poke a few airholes for me! I hope your brother is doing better. I can’t imagine what it’s like to watch a loved one go through what he’s gone through…and of course what you’ve gone through. My prayers to you and your brother. Beautiful post – and so true! I really responded to this one: I still have too much of the ‘lone wolf’ in me, and my tendencies are still to push people away. I am working on this. But I have discovered the joy of helping others, speaking up for others, sharing with others. And I’m getting better at it, all the time. Thanks Michelle. Means a lot to me for you to say that. Yeah, the lone wolf comes up still – I too have to work on it. It’s old thinking, eh? <—- My Canadian accent just came out. Exactly. Great blog and it does what you set out to accomplish. i was just thinking about how glad i am that my bottom was so hard because it left me in a place where i had to admit i couldn’t control my life. That i was 100% powerless over my drinking. That my life had become completely unmanageable. That my only way out was to swallow my pride and seek help. And swallow our pride we had to, to get to the wonderful place we are now, of being of service and connecting to our true selves in a way that we never would or could have in our drinking days. You nailed it right on, Al. You understand what it takes – and that inspires me. I am always in awe of those that can rise above their pride and humble themselves and ask for help, they are so much farther ahead of the game then I was. All those years I wasted because of my damn pride, all those years I could have live my life instead of cowering in the darkness and shame of alcoholism. Thank God there are people like you shining your light into those dark corners, telling people like me it’s okay to step out into the light. Thanks KM! Right back at ya! Pride is a killer for us, isn’t it? I know my pride then almost destroyed me, and even now I have to keep it in check, and working with others helps in that. We may have wasted some time, but I look at it that we have been preparing for this, this recovery, this way to help others. Perhaps it’s our “training time”. I love synchronicity! We have all been there, Fern…that’s why we hold tightly to one another…to help one another out. We get this, however,,, I cannot have “healthy” sobriety unless my head is in the game of paying it forward. 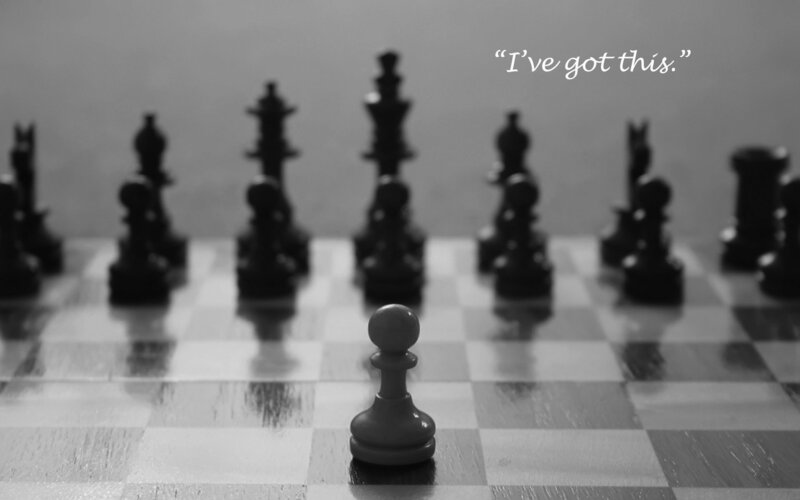 In regard to “I got this” – I will share that just the past few weeks I (in retrospect) found myself in the “I got this” mentality,. And let me tell you – that is a slippery slope NONE of us can afford. Recovery DEMANDS daily vigilance. . That cunningness of this disease never rests and will lie to us at every turn,. Hi Dawn – thank you so much for chilling a bit in this corner of the recovery world! You are absolutely bang on about the daily vigilance. As you know, we have a daily reprieve contingent on the maintenance of our spiritual condition. And like you so well said, the “I got this” thing often fails us. I have to pass it all to the Creator. Let Him have it. Wonderful comments…so blessed to read them here! Paul, *you* are needed. Your blog is an inspiration to read and you are reaching so many people who benefit from your messages. The ripple effect (or butterfly effect) is far reaching here my friend. You’re a blessing. Wow, Christy – you made my day indeed. I can only hope that my ramblings can help another alcoholic or not in any way. We are all about planting seeds and connecting as alcoholics and human beings. You certainly reach me and others with your words as well. Self sufficient – you just said it. We let that go wild and where did it take us? I think there is a distinction between using the talents and brains we were given to be used positively, and the self-sufficiency that doesn’t allow anything or anyone else in. I too was about doing as much as I could (and taking on too much) growing up, thinking I could handle it all…and it was a very long time until I realized that I could NOT do it all alone. I always tell newcomers they can start being of service right away. By reaching out to another alcoholic for help. By accepting that help, they are helping another stay sober. Win/win, eh? I’m so glad when Bill W. was in that hotel lobby in Akron, and he heard the tinkling of glasses from the bar, he decided to get a load of nickles and start making calls instead of getting drunk. If he had taken a left instead of a right in Albuquerque, I might not be sober. Talk about a butterfly effect. Beautifully written, as always, Paul. Trudge on! I’m slogging right beside you, pally. Thanks Marius…what you say is dead on. Win / win indeed. Let’s trudge together, kind sir. An honour and pleasure having you here, as usual.